Official Image for the 2012 Slice of Life Story Challenge. Official image #2 for the 2012 Slice of Life Story Challenge. Here is a button just for this year’s challenge. Please copy it & use it on your SOLS posts. (To do this: 1. Right click on the image and choose “Save image as.” 2. Save the image to a place where you can find it (your desktop is usually a safe choice). 3. Upload the image to your blog and use on your SOLS posts.) I’m pretty sure the background will be white now instead of grey. Each day there will be a SOLS post for you to link the unique URL of your daily Slice. For instructions on how to do this, click here. Leave comments for other Slicers. One of the reasons this challenge is so powerful is because of the writing community that emerges. As one new Slicer told me last week, “It feels like Christmas every time I get a comment.” Comments are gifts. Try to comment on three slices each day. If your students are slicing from their personal blogs, please have them link their blog posts to your blog and then share the unique URL to the location of the “round up” of student slices. 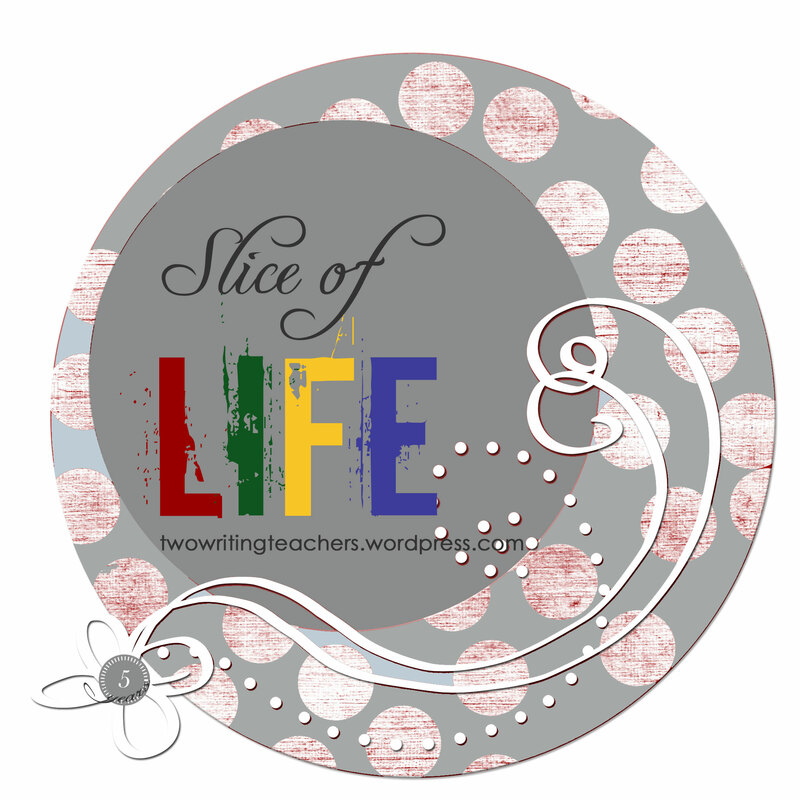 Post a student slice each day to your blog. This could be by scanning students’ Slices or by typing them as a post. For our purposes, you could share a different student’s slice each day. So if you post one per a day (and you have less than 31 students) every student would share at least one Slice. If you have another idea, let me know. In the interest of managing the challenge and to build a writing community among traditional Two Writing Teacher readers, I think it is best if K-12 classrooms participating in the challenge share their links via a round up. More with less is my topic for today. Check out my blog and give me your “more with less” comment or line. Okay, I’ll give this a shot…a day late! This is my trying-it slice to make sure I am doing this correctly. I was glad to see you too. I loved your striped sweater. 🙂 Glad you are joining the challenge. Please help – I’d love to try to participate in SOLC this year but am unclear as to exactly how to do this. Do I have to have my own blog. Do I post my entries somewhere via this website???? Could you clear this up for me. Thanks. 1. Yes, you have to have your own blog. 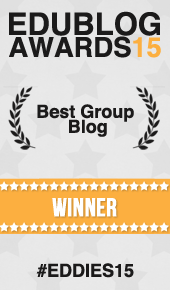 I recommend going to blogger.com if you have a Google account. If you don’t want to set up a Google account, then go to wordpress.com. You will be able to follow the steps and have your own online writing space within minutes. 2. You will link your unique URL (notice the link in this post for directions) each day in March. There will be a daily Slice of Life post and you add your unique URL in the comments each day. This is my first time in the challenge too. I’m excited! If anyone sees this post and thinks, “Whoa, this girl totally missed the mark,” feel free to let me know…I won’t at all be offended. Thanks and I look forward to getting to know you all better through this new world! Okay, first you are PERFECT in sharing the unique URL of your post. This is exactly what you will need to share each day during the challenge. Also, your post is just fine. I enjoyed knowing the background of the name of your blog and the reason you chose the image you did for your header. I admire your courage to step out into this world of blogging and make your thoughts public. This isn’t an “official” slice of life post. You’ll share your links each day on the daily slice post. You can practice tomorrow if you want, because outside of March we host a year-round Tuesday Slice of Life Story. LMK if you have any more questions. Thank you for setting up this challenge. I am excited and nervous to join in for the first time! I just set up my very basic blog. Here we go! This will be my first time joining the Slice. I was just wondering if there are rules for what you write and length. Does it have to be an official story each day, or is it more like anything I would write in a writer’s notebook–poems, thoughts, venting, celebrating, etc? Thanks! Deanna — No rules for length or what you write. It can be a list or a poem or a story or anything else. The idea is to share a glimpse into your life every day. Some days the glimpse might be from the day, other days you might be reminded of something that happened long ago. The heart of the challenge is to develop a writing habit.